Waterline Controls is a set of control panels specifically engineered for different applications like Boilers, Lift Stations, Pumping Stations & Cooling towers. While you can use float switches with our controls we try to eliminate mechanical failure points. Anytime possible we strongly urge using the sensor probes (solid state) we provide as part of our system because they are usually lower cost, they don’t foul, deteriorate or stick open, have no moving parts and are easy to trouble-shoot. 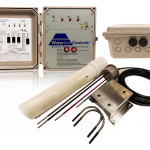 WaterLine Controls accepts any normally open or normally closed electric float switch (depending on the model you use) to activate the control circuit. Dwyer Instruments products could qualify for some of those applications. Call us to today and we can assist in the design of your system needs.